Via de las Olas, which was taken out of public use, may be reopened by the City if slope movement can be gauged. That 12-hour notice might explain why there were only four residents, two newspaper reporters and four people representing the city and Ninyo and Moore, a geotechnical firm, at the meeting. Ninyo and Moore has been hired by the city for $150,000 to inspect the existing 22 hydraugers (a way to drain water from the hillside before it saturates the face of the slope) below Via de las Olas. Typically, hydraugers are constructed by drilling a hole into a slope and installing a slotted pipe, with the outlet connected to a discharge area. Palisades resident Roger Diamond, a leader in the 20-year No Oil! campaign that successfully prevented oil drilling on the flat land below Via de las Olas in the late 1980s, asked two city officials—Councilman Mike Bonin’s field deputy Sharon Shapiro and BOE’s Craig Kunes—who had initiated the hydrauger request. Kunesh responded, “Recreation and Parks.” Diamond asked who in that department, and why now. Kunesh said he would find out. Originally, Via de la Paz street connected to Pacific Coast Highway prior to March 17, 1958, when a landslide at the west end of Via de las Olas brought tons of dirt onto a 200-yard section of PCH, closing the road. In the efforts to reopen the road, Vaugh O. Cheff, highway superintendent of the California Department of Transportation, was buried and died in a subsequent slide. With that slide, access to PCH from Via de la Paz was permanently closed. Shortly after the 2004 letter went to homeowners, a new bulkhead was built on the bluff near Friends Street, below Via de las Olas, and a portion of the street repaved. The road between Via de la Paz and Mount Holyoke remained closed to all but local residents. In Miscikowski’s letter, Option 3 (“Full Improvements”) was to reconstruct the en- tire street at an estimated cost of $560,000. At the hydrauger presentation, Diamond told Shapiro and Kunesh that as part of the Proposition O victory (in 1988), Occidental Petroleum was required to maintain the hydraugers. The Times later reported that in the No- vember election that year, “Los Angeles voters handed Occidental Petroleum a stunning defeat by narrowly approving Propo- sition O, which repeals three ordinances authorizing the oil giant to drill in Pacific Palisades. 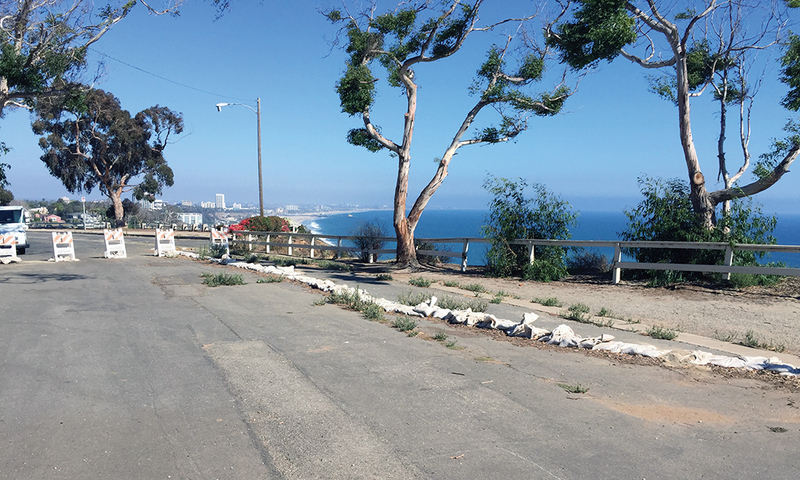 “At the same time, voters by a 2 to 1 margin turned down Occidental’s counter-initiative, Proposition P. The vote, coming after the most expensive campaign in city history, could mean the end of Occidental’s decades-old attempt to drill in Pacific Palisades. Diamond said at the July 18 meeting, “The agreement made with Oxy and the city is still enforceable.” Shapiro and Kunesh said they would investigate. At that meeting, Diamond said, “They wanted to change the zone below the bluff from R-I to SL Ocean (submerged land zone).” Since oil drilling isn’t allowed in a residential zone, the change would have made the land drillable. Diamond’s lonely attendance at that obscure meeting led to a 20-year legal battle that ended with Proposition O. “When you come to a meeting that isn’t publicized, you’re naturally a little suspicious,” Diamond said. In the meantime, Ninyo and Moore will began locating the existing hydraugers that were installed in the bluff by Occidental and clean them if necessary. Three borings will also be done at the top of the hill to further evaluate the landslide area, and four inclinometers will be installed to measure the slopes. The work was scheduled to begin on July 25 and will take about four weeks.